Are you looking for a delicious vegetables recipe with a difference? If you are, you’ve found it! 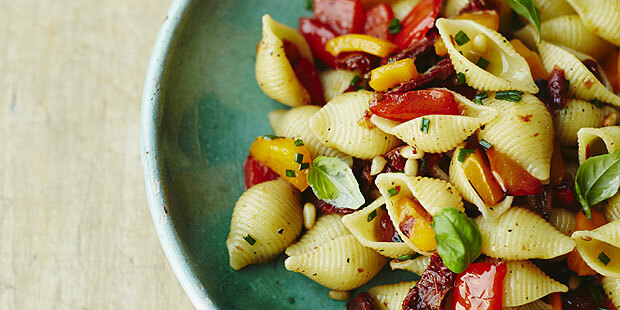 Here’s my shell pasta with peppers, sun-dried tomatoes and pine nuts for you to enjoy. 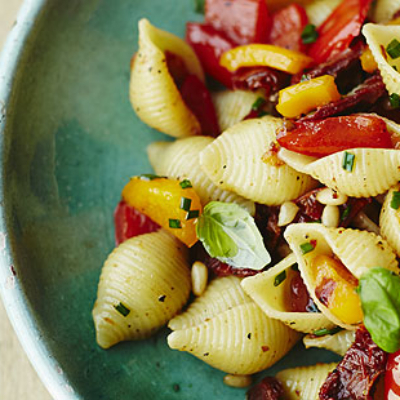 Feast your eyes on the finest shell pasta with peppers, sun-dried tomatoes and pine nuts! It’s straightforward and fun to make this great dish. Simply follow the instructions below and get the perfect result. In a large saucepan, bring 5 litres of water to the boil with 1½ tablespoons of fine salt. On a chopping board, with the help of a sharp knife, cut the peppers in half, discard the seeds and chop into 1cm cubes. Heat the olive oil in a large frying pan over a medium heat and fry the garlic and peppers for 5 minutes. Stir occasionally with a wooden spoon. Season with salt and pepper before adding in the sun-dried tomatoes and pine nuts. Cook for 2 minutes. Meanwhile, cook the pasta in the boiling water until al dente. 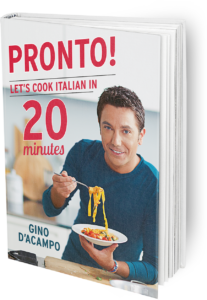 To get the al dente perfect bite, cook the pasta for 1 minute less then instructed on the packet and always leave the pan uncovered. A good-quality dried pasta will take 8–10 minutes to cook. Once the pasta is cooked, drain and tip it back into the same saucepan that you cooked it in. Pour over the prepared sauce, put the saucepan over a medium heat and mix all of the ingredients together for 30 seconds allowing all the flavours to combine beautifully. Scatter with basil leaves then divide the pasta between 4 serving plates and serve immediately. Once you’re done, simply sit back and enjoy your shell pasta with peppers, sun-dried tomatoes and pine nuts and don’t forget to check out other great authentic Italian recipes including great antipasti recipes, Italian pasta recipes, Italian soup recipes, Italian beef dishes and authentic pizza recipes.